Are you wondering how you can train your dog with treats yet still keep him lean? Perhaps you are wondering what healthy food is safe for your Rottweiler? This breed of dog certainly loves treats. Giving your dog fruits and vegetables on occasion can be great for your dog. But we must be very cautious feeding them things other than dog food. Read on for some fresh food guidance! There are many foods that are not safe to feed to your dog, but there are several things that are perfectly fine for them to snack on. 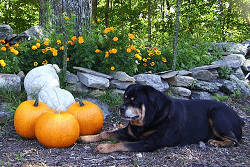 Here is a list of vegetables that are safe for giving to your Rottweiler as treats. I also included a description of the benefits and any other information you may need about preparing the food for safe consumption. Always remember to wash off raw vegetables before giving to your dog because lots of raw vegetables may have dangerous pesticides on them. 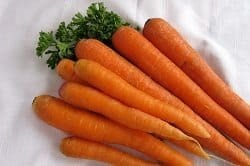 Carrots are a great treat for your dog. They contain beta carotene, are high in fiber, and rich in vitamins A, C, and K. That means they are great for the eyes and skin. They are also rich in antioxidants, which can help prevent cancer. They are great for your dogs teeth, and they are known for being delicious! Many dog foods actually have carrots listed right in the ingredients. Sweet potatoes are commonly seen in dog treats and listed in dog foods. They are used as a starch substitute for dogs with allergies. They are a great source of vitamins, including vitamins A, C, B5, and B6. Sweet potatoes are a great treat for your Rottweiler with a sensitive stomach, and are gentle on the digestive system. Peas are another great treat for your Rottweiler. There are so many nutrients packed into these tiny veggies, it’s unreal! The vitamins contained in these amazingly small treats are vast, they are great fed raw or cooked. Asparagus is a great treat for your dog. They contain lots of vitamins and minerals such as A, C, K, B1, B2, folate, copper, and iron. This can be a great treat for you dog, especially if they happen to have diarrhea, constipation, or simply a sensitive stomach. Pumpkin contains lots of fiber that absorbs water and helps ease stomach upset. It also contains vitamin A and has lots of antioxidants. Green beans are high in vitamins such as A, K, and C, and also contain manganese. This treat is great for a dog who is overweight because you can replace some of their food with green beans which will nourish them, but not load them up with calories. Rottweilers also like fruit! There are a number of safe fruits you can give to your dog for treats that are great for them and taste delicious! Besides being high in antioxidants and minerals, and rich in vitamins A, C, B1, and B2, cranberries can also greatly improve your dog’s urinary tract health. They can also help prevent and control urinary tract infections by lowering the pH of your dog’s urine, therefore making it more acidic. They can be fed to them raw, frozen, or cooked. They are also great for you as well! Blueberries are one of the richest fruits in antioxidants. They can also reduce tear stains on your Rottweiler’s face! When it comes to overall health, blueberries are very similar to cranberries. They can be fed to your dog raw or frozen. Bananas are a great energy source for your Rottweiler. They are full of natural sugars that are easy to metabolise and convert into energy. 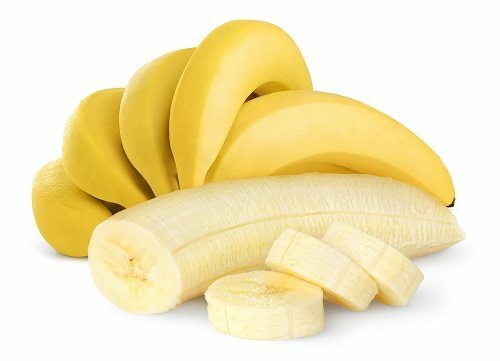 They are loaded with essential amino acids, potassium, electrolytes, minerals, vitamins C, and B6. They can also aid in improving heart function and maintaining normal blood pressure. Apples are a great source of vitamins A and C. They also are rich in antioxidants. 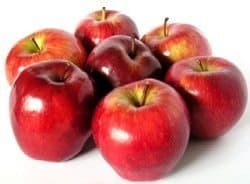 Apples also contain pectin, which is a fiber that creates short­chain fatty acids which help get rid of toxins in the intestinal tract, strengthens intestinal muscles, and ward off dangerous bacteria. Cantaloupe is an excellent source of nutrients. They contain vitamins A, C, B6, and beta carotene which is great for the ocular health of your dog. Cantaloupe is generally an easily digested and hypoallergenic fruit, so it is great to feed to your Rottweiler if they have food allergies or a sensitive stomach. Cantaloupe can also aid a dehydrated dog. Toss them some as a treat if they look like they may be dehydrated. Make sure you do not feed them the skin, just the fruit. There are some fruits and vegetables we must never feed to a Rottweiler. Never feed your dog grapes, raisins, onions, or garlic. They have all been classified as unsafe for doggy consumption. Stick to the fruits and vegetables on this list, and if you do not know if it is safe, do not feed it to them, the results can actually be fatal! Many of these foods can be frozen to help teething puppies and utilized as general treats to keep your dog active and fit.